Summary (from the back of the book): Nowhere...Nothing to do...No one to talk to. For wannabe artist Amanda Walsh, who goes by the nickname Zero, the summer before college was perfectly mapped out because she: Got into an art school that would take her far, far away from Phoenix (except she didn't get must-have scholarship money); Had awesome plans with her best friend, Jenn (but they're not talking...at all); Was fairly adept at dodging both of her parent through silence and evasion (yet somehow she's pulled into their fights, which just get louder and louder). Now Zero's prospects are looking as bleak and surreal as a painting by her idol, Salvador Dali. Will life truly imitate art? Or will her new, unexpected relationship with a punk skater boy and support rom the unlikeliest of places help Zero understand that she's so much more than a name? 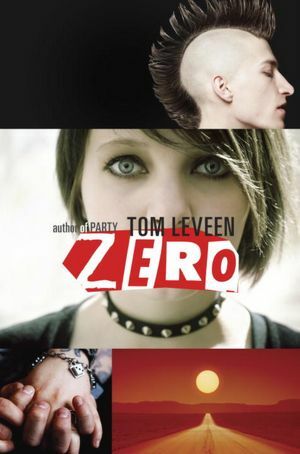 Review: I really liked Tom Leveen's Party so was looking forward to reading his second novel, Zero. Overall I think it's a good book that students will enjoy. Tom Leveen is good at creating believable, likable characters. Even though Amanda/Zero is grumpy and a bit mad at the world, I like her. She is going through a lot right after high school graduation with an alcoholic father, fighting parents, issues with her best friend, and no college plans. She loves art, but isn't quite sure that she is talented enough to "make it." Mike, her love interest, is also a good guy. He is honest, makes her feel good about herself, but isn't perfect. He has issues and that makes him real. Even the supporting characters bring important human foibles, issues, and insights to the book. None of them are just there as fillers; they all contribute to the understanding of Amanda and her situation. I also liked the themes that ran through this book: art; music; striking out on your own; family squabbles; and finding oneself. So many YA books contain DRAMA, while this book is gentler. It is life rather than teen angst and exaggerated junk (for lack of a better word). I cared about Amanda and Mike, I cared about her art and his music and I wanted their lives to work out. I don't mean I expected it all to be perfect and happy, but I wanted them to figure out what they wanted and they do even though the reader isn't totally sure where they will end up.